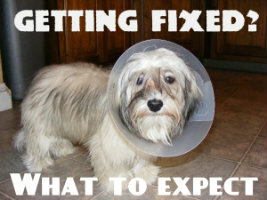 Many of you will be preparing to bring your puppy in for spay or neuter surgery. Generally, the surgery is scheduled around six months of age. What exactly does the surgery entail? What should you expect afterwards? This specific article was carefully selected for you in order to provide you with the most reliable information. At Renaissance, we have had several dogs altered, by rule our females are only bred 2-3 times before they are spayed. Over the years we have have had several dogs altered at all different ages. I wholeheartedly believe that a dog that has been spayed or neutered needs to be nurtured. Most times, your dazed puppy is handed back to you and you’re given a sheet of paper and told to feed them just a little and call if your dog has any symptoms on the list. Don’t despair, with some advanced planning and knowledge, you can be a great help to your pet. Pre-op bloodwork is a must for all dogs. This is the best way to confirm that the internal organs are healthy enough for anaesthesia. Generally, this has to be done in advance of the day of surgery. No Vaccines. This is not the recommended time for a vaccination. Vaccines engage the immune system. Your dog needs an immune system that is not busy in order to heal from the surgery and anaesthesia, so it would be wise to hold off for a couple weeks. Blanket. When I drop my puppy off for surgery, I bring along a blanket and ask the technician to put this blanket in with my puppy when they are placed in the recovery kennel. If you have children, it may help ease the anxiety of being separated from their puppy by having them sleep with the blanket the night before and tell them that in this way their puppy can have them “close by” after their surgery. Nutri-Cal® a high-calorie meal replacement that contains beneficial vitamins and calories, essential for energy. So my dog is still getting the benefits of a meal without the effort of having to eat and it is the bulk of kibble or canned food in the belly which contributes to a sick stomach, the very reason why we are instructed not to offer them a full meal. Organic chicken stock. I choose stock for the simplicity of ingredients. The broth is very dense and often contains a lot of salt and other ingredients such as MSG. I offer water first but in the event that my puppy refuses to drink it, I will offer stock. I continue alternating between offering water and if there is still no interest, offer the stock and eventually dilute the stock with water (1:1) for the rest of the evening. The goal is to encourage my puppy to drink more because this will cleanse the body by flushing out the anaesthesia. Drinking should be encouraged for the next few days. K9 Immune Dog™ With an older adult dog, I will use this product four weeks prior to surgery. This product should be continued after the surgery. It can also be used for a young dog following surgery. When my puppy comes home, I want to make sure that his crate is very comfortable, soft bedding is a must, especially for females who are often the most uncomfortable. In addition to a crate pad, I will line the crate with fleece blankets. I will cover three sides of the crate with a sheet and allow them to rest in a quiet space. At night they remain close by. A water bottle. I place the water bottle wrapped in a towel in a corner of the crate so that the puppy can decide to use it or not. A water bottle is the safest alternative to providing a little heat. Wee pads. Before you get concerned that allowing your housebroken puppy to once again use a pee pad, please read on. When you bring your puppy home, they often have little energy and are in no condition to get chilled. A pad not only provides easy access to relieve themselves without the risk of getting chilled. It also allows me to monitor that they are relieving themselves adequately and that there are no abnormalities like blood in the stool or urine. A couple of days of this will not undo your puppy’s housebreaking. Coughing after surgery. This is usually caused because of irritation to the throat due to intubation during surgery. However, if it persists beyond a few days, it could be Bordetella (kennel cough) acquired at the Veterinary hospital. While some Vets treat it with a dose of antibiotics, most dogs recover from this common condition (cold) without treatment.Vaccination does not provide100% protection. Infrared Light Therapy. My personal favorite. This NASA technology uses infrared light to stimulate the body to heal itself. It is a non-invasive, non-pharmaceutical, painless technique. Unfortunately, this quick and inexpensive treatment it is not widely available and not generally supported by traditional Veterinary medicine. I am lucky to have it available in my area and you may be able to find a contact with a holistic Veterinarian. Here are some links to the products I mentioned. The other items can be purchased at the pharmacy.